Using bitcoin as a method of payment may seem like an option only available in London’s more cutting-edge corners, but cryptocurrencies are already being used by SMEs across the UK. You may be surprised to learn that two World Firsts related to bitcoin have occurred in the county of Hertfordshire, or Herts, the very English land of Harry Potter studio tours and bucolic Garden Cities. Headline news was generated last year when the world’s first house sale by bitcoin happened in the region, as taking place in the Hertford branch of Go Move. This estate agent took the unique move of selling a four-bedroom townhouse for the price of 42 bitcoins, or what was then the equivalent of almost £595,000 ($807,000). This marked not only the first time that the UK Land Registry had given permission for a bitcoin transaction, but the first time in the world that a property had been sold using cryptocurrency. 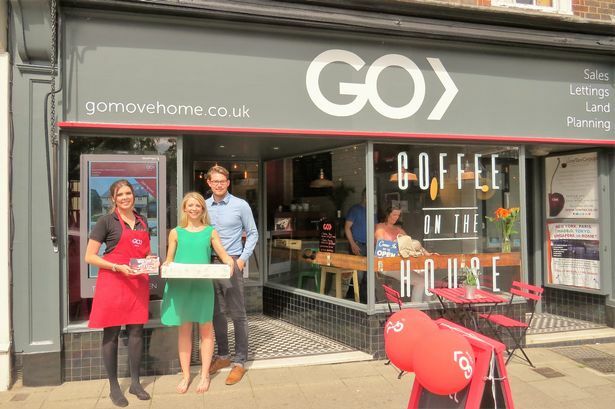 Go Move in Hertford celebrating their bitcoin sale in 2017. Cryptocurrencies may seem to most businesses like something that have only popped up in the last few years and which only the bigger names can play around with, but that would be overlooking a remarkable move by another Hertfordshire SME. Going back earlier this decade, the St Albans-based PrivateFly enabled the first public payment of a private jet flight in the world, flying tech entrepreneur Olivier Janssens from Brussels to Nice for an undisclosed sum in 2014. Other Hertfordshire businesses like the Station Garage Stortford repair service and Rickmansworth’s Loudwater Farm are also accepting bitcoin from their customers, in news which shouldn’t be surprising to anyone familiar with this area. After all, Herts was where the Garden City Movement first began before spreading around the world, in an early example of this part of Eastern England’s forward-thinking nature. Any bitcoin users in the UK who are curious where they can use their digital wallets should check out the handy database at Where to Spend Bitcoins UK. Confused about bitcoin? Then read this handy guide from Coin Desk.